Closing in on nearly two decades in court, this “David and Goliath” fight seems far from over. Plaintiffs contend that no amount of money can repair the damage to the environment and to the lives of the 30,000 who claim to have been affected, while the U.S. oil company has denounced the Ecuadorean court system as corrupt. 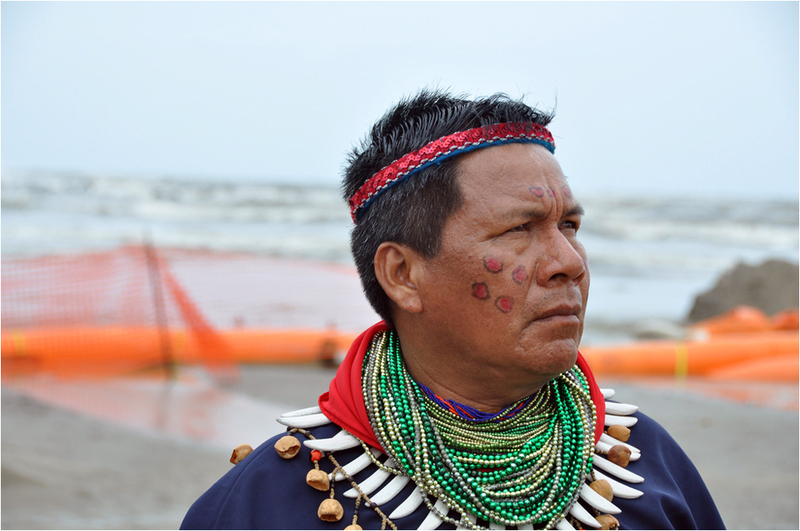 Emergildo Criollo, leader of the Cofan indigenous tribe, was part of the Ecuadorean delegation that visited the United Houma Nation in Louisiana after the BP Deepwater Horizon spill in 2010. On Tuesday, an Ecuadorean appeals court upheld a ruling that Chevron Corp must pay $US 18 billion in damages to the government of Ecuador for allegedly polluting the Amazon River basin and damaging people’s health, Reuters reported. An Ecuadorean judge had ordered the U.S. oil giant to pay $US 8.6 billion in environmental damages last February, but the amount was increased to about $US 18 billion after Chevron failed to make a public apology, as required by the original ruling. “We ratify the ruling of Febuary 14, 2011, in all its parts, including the sentence for moral reparation,” the court in the Amazonian city of Lago Agrio said in its ruling on Tuesday. In the next chapter of the 18-year bitter legal dispute, Chevron — which is currently also battling claims that it is responsible for environmental damage from an offshore oil spill in Brazil last November — quickly denounced Tuesday’s appellate court decision, calling it “illegitimate” and a fraud, according to Reuters. Chevron accuses the lawyers of misconduct, including fabricating expert reports, manufacturing evidence, bribing and colluding with court officials, among others. In a statement, the company also said it was pursuing an action in the U.S. District Court for the Southern District of New York against the plaintiffs’ lawyers for violations of the federal racketeering statute and common-law fraud. Chevron is also banking on international arbitrators, who are expected to decide this month if they will weigh in on what has become a landmark international legal dispute. The laswsuit against the U.S. oil company was brought on behalf of 30,000 Ecuadoreans from the Amazon River basin, who accuse Texaco – which Chevron acquired in 2001 – of dumping 450 million barrels (19 billion gallons) of toxic oilfield waste and 400,000 barrels (17 million gallons) of raw crude oil into unlined pits and rivers in the Amazon jungle between 1972 and 1992 and of damaging indigenous people’s health, according to the BBC. The local community asserts that decades of negligent drilling have polluted nearly 5,000 square kilometers (2,000 square miles) of Amazon waterways traditionally used by for laundry, cooking, drinking, and bathing. Chevron denies responsibility, saying that Texaco had cleaned up its share of waste pits. The company also argues that investigators have found no scientific evidence of the long-term environmental, health, and social damage that the plaintiffs describe. Commenting on the appellate court’s ruling, Ecuador’s president, Rafael Correa, said he was happy and described the dispute as a “David and Goliath” battle.